Rubber gaskets provide sealing and insulation in water delivery and water filtration systems, wastewater treatment plants, and other applications involving potable or non-potable water. Material selection is important, and buyers need to choose compounds that meet all of their application requirements – including NSF/ANSI Standard 61, if applicable. Gasket designers must also consider fabrication methods such as precision die cutting, which can produce rubber seals in a wide variety of shapes with tight tolerances. In all 50 U.S. states, gasket materials that come into contact with potable water systems need to meet the requirements of NSF/ANSI Standard 61, which is designed to ensure safe, clean drinking water. Often, EPDM rubber materials are used. To prevent pollutants or contaminants from entering drinking water supplies, these water gaskets must be die cut precisely and installed correctly for proper sealing. 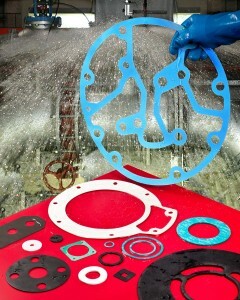 Gaskets for non-potable water also perform important sealing functions. Non-potable water supplies aren’t safe for human consumption, but they are suitable for irrigation and industrial applications. Custom gaskets that are used in water reuse, water recycling, or gray water programs need to withstand dirt or detergents as well as outdoor environments. Die cutting helps to promote sealing and prevent leaks and water waste. Sanitary sewage, fresh water, salt water, and wastewater treatment applications also need die cut rubber gaskets that meet application-specific requirements. For example, the water-resistant seals and gaskets that are used in wastewater treatment systems need to withstand exposure to high-temperatures, oils and greases, and even chemicals. Some of these gaskets are large, but die cutting supports a range of part sizes. Does your sealing or insulation application require die cut water gaskets or die cut wastewater gaskets? Would you like to learn more about rubber materials, the NSF/ANSI 61 standard, or precision die cutting for large or small parts and tight tolerances? To learn how Interstate Specialty Products’ industry knowledge and die cutting capabilities can support your application, contact us on-line or call (800) 984-1811.